This article is part of our special report Mobile World Congress. SPECIAL REPORT / The European Commission is seeking a leadership role in developing new generation telecom networks using 5G technology. But its efforts were thwarted as EU national ministers met in Brussels Tuesday (3 March) to dilute telecoms reforms vital to the idea. Delegates to the Mobile World Congress (MWC) in Barcelona were presented yesterday with grand European plans for developing 5G networks. “The digital economy is simply becoming the economy. And the future network infrastructure, 5G, will become the infrastructure,” said Günther Oettinger, the EU Commissioner for digital economy and society, who was launching the EU’s ‘5G vision’ in Barcelona. “With the Internet of Things, we see a new era of connectivity where billions of devices exchange data and instill intelligence in our everyday life. From watches to shoes. From fridges to heating. From hospitals to factories,” Oettinger told delegates. “With 5G, telecom operators should be able to provide specialised network services to a series of new industry partners: from the automotive, to rail, health or energy sectors,” the German Commissioner subsequently told journalists during a press conference. Oettinger was joined at the conference by representatives from nine global tech firms signed up to the 5G Public Private Partnership. These included chief technology officers from Alcatel-Lucent, Docomo, Ericsson, Huawei, Nokia and Samsung. “The omnipresence of the Internet through connected devices will make it possible to remote control everything,” Stéphane Richard, the CEO of Orange told a keynote seminar at MWC on the subject. “50 billion objects will be connected by 2020. We are at the dawn of a new era and 5G is at the heart of that,” Richards added. “5G will become a powerful tech platform enabling new applications, business models and industries,” said Ken Hu, the rotating CEO of Huawei, the China-headquartered tech giant which is also signed up to the PPP. Huawei announced last November that it planned to invest €442 million in research into 5G. “The doors to the future digital world have opened up. We are at the beginning of the beginning,” said Hu. Oettinger stressed that the PPP aims to lay an open foundation for the creation of standardisation with full industry and geographical cooperation. “I am optimistic that with your leadership, we will avoid a ‘war’ on standards, contrasting clearly with the situation at the start of the previous generations of communications systems,” the German Commissioner said addressing business leaders, referring to the onset of 3G and 4G networks. The move sees a growing tie-up between the EU and Asia, following an agreement reached last year to team up with South Korea on 5G. Oettinger signalled his intention to sign similar agreements with Japan, China – possibly as early as this year – and the US. ChinaEU, a Brussels-based, business-led association promoting ICT cooperation between Europe and China, called upon the two sides to start a strategic collaboration on 5G as soon as possible. The group is looking to a forthcoming China-EU Summit, scheduled to be held this June in Brussels, as an opportunity for the two regions to launch an official partnership on 5G. “A cooperation between Europe and China on 5G will open the door to both the Chinese and the European industry to the biggest and richest markets in the world respectively and create the conditions to invest more in European and Chinese digital economies,” said Luigi Gambardella, ChinaEU’s president. “We see great interest from both sides to enhance cooperation in Internet, telecom and (the) high tech segments,” he added. However, news from Brussels suggesting that EU member states are diluting single telecommunications market proposals provided a sour backdrop for the announcement. The new regulatory framework, along with 5G, provides a cornerstone of the Commission’s single digital market proposal, currently being finalised. 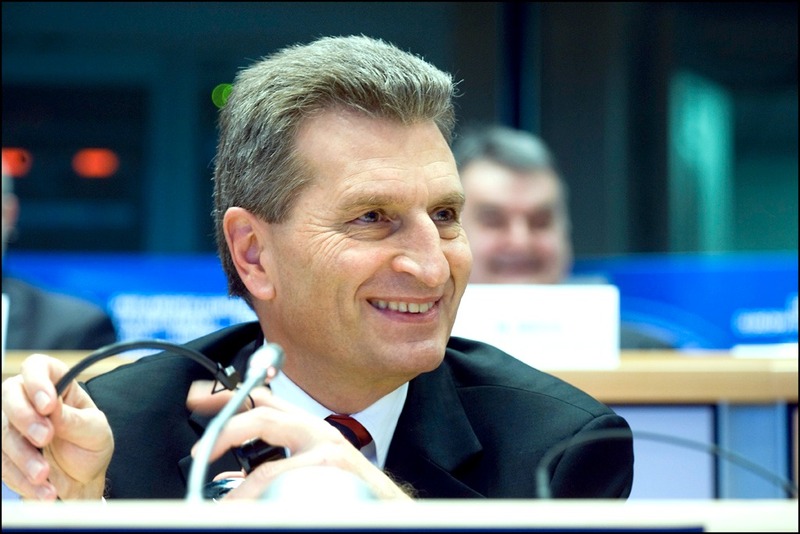 Oettinger echoed appeals made on Monday (2 March) in Barcelona by Vice-President Andrus Ansip that coordination of European spectrum is vital for the future Telecom Single Market and also for the development of 5G mobile communications. Member states are today (4 March) set to adopt a position the Telecoms Single Market proposal, drafts of which suggest substantial diluting of proposals for net neutrality, a ban on surcharging for the use of mobile phones throughout the EU, and provisions for harmonising the approach of member states to spectrum. Oettinger said problems connected to spectrum allotment “relates to finance ministers having dollar signs in their eyes”, alluding to member states’ jealousy in guarding the right to auction off spectrum for eye-watering sums. Finding new spectrum and coordinating it effectively is seen as critical to the development of 5G. The Commissioner said that responsibility for spectrum should fall under the auspices of ministers of digital affairs, rather than within treasury departments. Guy Verhofstadt, the president of the Alliance of Liberals & Democrats for Europe in the European Parliament, described the development as “a scandal”. “An end to roaming charges and the delivery of a genuine single market for telecoms was a campaign priority for all parties, many of whom are today responsible for blocking this measure,” he said. Europe led competition in GSM technology in the 1990s, but fell behind the US and Asia in the rollout of faster 4G connections. A 5G mobile network would offer connections able to cope with the ever-increasing number of mobile internet users and hyper-connectivity, sometimes called the Internet of Things. The EU said in December 2014 it would spend €700 million ($953 million) on 5G technology research over the next seven years, while companies in the telecoms sector would provide more than €3 billion. The EU launched launched a 5G Public Private Partnership last Spring with €700 million earmarked under the Horizon 2020 Research and innovation programme, while industry partners have committed to leverage the EU funding by up to five times. A set of EU projects on 5G is already reaching completion. Oettinger said that research grants for €125 million will soon be granted to 20 projects to deliver key building blocks for 5G including network architecture, new radio technologies, new service platforms, and innovative utilisation of spectrum. U’s ‘5G vision ?? Where to use when i have the Roaming (R) activated ! Even If you have Flat rate in your country With 5G You may get very poor if you forget to deactivate your data abroad ! It’s a vision for telecom-operators to fill their pockets again unlike in the U.S. ! Actually some will laugh but i Use Edge on data and in no way 3G /H+ and so on ! I’m sure Edge is perfect for you, no point in using free wifi when there is Edge available you never know when the boogie man is trying to hack your phone of wifi do you?